This page is a collection of resources, thoughts, quotes, and research that highlights the importance of every student having the opportunity to have an art class. Nationwide, less than 1/2 of our students now have that opportunity. "A fine arts education — including music, theater, drawing, painting, or sculpture — whether in practice or theory, has been a part of any well-rounded curriculum for decades — but that may be changing. Many schools today are cutting back or eliminating their art programs due to budget constraints. It is estimated that by the end of this year, more than 25% of public high schools will have completely dismantled them. These stats aren’t just bad news for teachers working in the arts, such as those at traditional schools for dance or online colleges for photography. Numerous studies done over the past decade have demonstrated the amazing benefits of such an integral education facet. Students who don’t have access to art classes may not only miss out on a key creative outlet, but might also face greater difficulty mastering core subjects, higher dropout rates and more disciplinary problems. Here, we’ve listed some of the biggest on the arts in education conducted over the past decade. Taken on by research organizations, college professors and school districts themselves, the studies reveal the power of art to inspire, motivate and educate today’s students. And, of course, demonstrate what a disservice many schools are doing by undervaluing such an integral part of their education and development. "The 2006 Solomon R. Guggenheim Museum study on art education showed a link between arts education and improved literacy skills. The study was the result of a pilot program through the Guggenheim called Learning Through Art, which sent artists into schools to teach students and help them create their own masterpieces. Kids who took part in the program performed better on six different categories of literacy and critical thinking skills than those who did not. "A 2005 report by the Rand Corporation called “A Portrait of the Visual Arts” argues that art education does more than just give students a creative outlet. It can actually help connect them to the larger world, ultimately improving community cohesion. A bold assertion, but not one without merit. Students from lower income families often get little exposure to the arts if they are not provided by schools. The report shows that arts education can help close the gap between socioeconomic groups, creating a more level playing field between children who may not be exposed to these enrichment experiences outside of school and some of their more privileged peers." 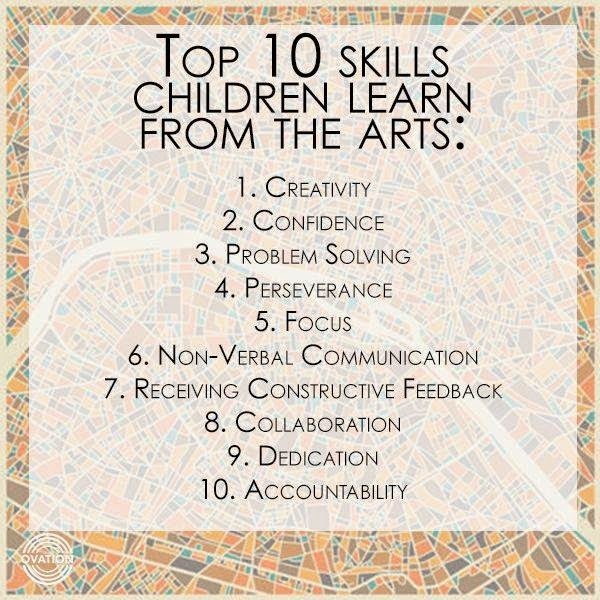 "Teachers and students alike benefit from schools that have strong art climates, a 1999 study called “Learning In and Through the Arts” demonstrated.The report studied students at 12 New York, Connecticut, Virginia and South Carolina schools to compile their results. Not only were students at schools with high levels of art education earning higher scores on critical thinking tests, but teachers also seemed happier. That wasn’t all, however, as teachers at schools that emphasized arts education enjoyed greater job satisfaction, were more interested in their work and likely to be innovative and pursued personal development experiences. It’s not a trivial finding, as what is good for instructors is often very good for their students as well." "The Center for Arts Education published a report in 2009 that suggests arts education may improve graduation rates. Taking a look at the role of arts education in New York public schools, this report found that schools with the lowest access also had the highest dropout rates. Conversely, those with the highest graduation rates also had the greatest access to arts education and resources. While there are undoubtedly a number of other factors that play into graduation rates, the research in this study and others like it (most notably The Role of the Fine and Performing Arts in High School Dropout Prevention,) has found that many at-risk students cite participation in the arts as their reason for staying. Participation in these activities has a quantifiable impact on levels of delinquency, truancy and academic performance." "A 2011 study called “Reinvesting in Arts Education” found that integrating arts with other subjects can help raise achievement levels. Arts education may not just help raise test scores, but also the learning process itself, as a recent study revealed. This report on the Maryland school system found that skills learned in the visual arts could help improve reading and the counterparts fostered in playing an instrument could be applied to math." "A study of Missouri public schools in 2010 found that greater arts education led to fewer disciplinary infractions and higher attendance, graduation rates and test scores. Using data submitted by the state’s public schools, the Missouri Department of Education and the Missouri Alliance for Arts Education compiled this report. They found that arts education had a significant effect on the academic and social success of their students. Those with greater arts participation were more likely to come to class, avoid being removed and graduate. Additionally, they demonstrated greater proficiency in mathematics and communication." "In “Neuroeducation: Learning, Arts and the Brain,” Johns Hopkins researchers shared findings showing that arts education can help rewire the brain in positive ways.Aspects of training in the arts, like motor control, attention and motivation, were studied by researchers who participated in the report, with some interesting results. In one four-year study, students motivated to practice a specific art form and spent time with focused attention increased the efficiency of their attention network as a whole, even when working in other areas of study — and it improved their fluid IQ scores." "A 2009 survey, part of the “Nation’s Report Card: Arts 2008″ report, found that access to arts education opportunities hasn’t changed much in a decade. Many of the problems that plagued arts education programs in schools ten years ago are still major issues today, this survey revealed. Middle school students across the nation haven’t seen an increase in access to music and visual arts education, and their understanding of its tenets remains low — especially in certain disenfranchised socioeconomic and racial groups. Many believe the numbers are even worse today, as the survey was conducted prior to the economic woes that have paralyzed many schools systems in recent years. As in 1997, the 2008 survey showed that only 47% of students had access to visual arts education, and just 57% to music education. The survey attempted to look at theater and dance programs, but since so few schools offer them, they were dropped from the study." "So, even if students score well on the tested subjects (mainly reading and math), have we really equipped them to complete in a world and in workplaces where higher-order skills like problem-solving and project-based learning are most valued? And what about how we inculcate a love of learning, or simply an engagement in schooling? There's no way our students can become the thinkers, innovators, and leaders of tomorrow if they have exclusively been "taught to the test," and taught only the subjects tested. That is not good enough. Students need rich, well-rounded curricula that ground them in areas ranging from science to the arts, history to government. Curricula should focus not just on content in key subject areas but also those higher-order skills such as critical thinking that are so necessary for college and career, and so vital to creating a new generation of inquisitors and innovators." My number one concern is that they are diminishing the art programs. We get very little funding, IF we get funding. We are overworked and underpaid. Our supplies are dwindling, and our time is limited. We, as art teachers, need even more time for in school prep. Yet, we are being strung out from school to school with very little prep. Some teachers are even having to fill their prep time teaching math and reading to various children. So... my primary concern is that the arts are diminishing in value in the eyes of those in power. I love my job, my students, and my principals. I am incredibly fortunate. But I see that many students are not getting the attention they need, and we can not delve into the kind of projects we might want to - because we simply don't have prep time in between the classes to prepare for them. 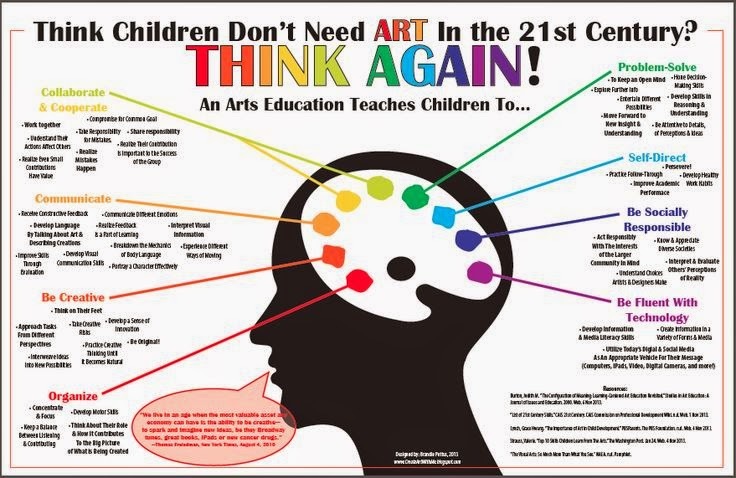 You are not alone in your concerns - it is apparent that art programs are dwindling in Alabama and I am hoping that AAEA and other advocacy organizations will be helping with this, soon! Studies do show that children who receive art education score higher on standardized tests and are more motivated to attend school. 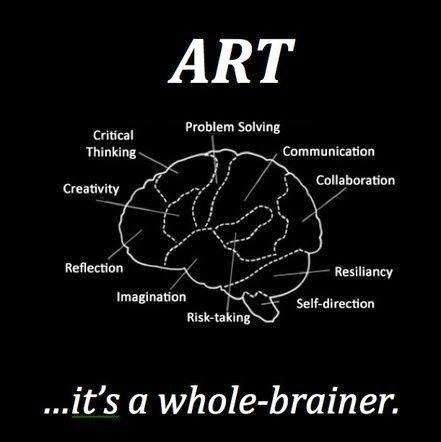 We as art educators know, also, that kids who have art classes are more well-rounded, creative problem-solvers, too! Of the 513 art teachers we have found here in the state, 62 teachers serve more than one school (that is about 12%) - I even heard from a wonderful lady down in Mobile who serves SIX different schools and calls herself an "itinerant" art teacher! I have learned so much from this project and I am more grateful for my job than ever. I have higher numbers this year than before, but I teach at only one school and I don't have to remember over 1000 names. I don't know how art and music teachers function when they are spread out among different schools! My hats off to you! Objective, logical fact, does change. When used in the realm of imagination and creativity, one plus one can equal 3, or 5, or 11! The power of synergy, according to Steven Covey (The 7 Habits of Highly Effective People), is when people share ideas, they both bring “right” answers to the table and they find much more innovative and powerful solutions to problems together than when working alone. There is so much power in intuition, in creativity, in imagination! 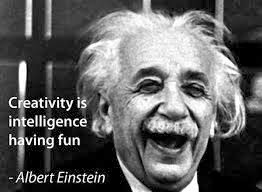 Albert Einstein said that imagination is more important than knowledge. Scientific “fact” is constantly changing. What we knew 100 years ago has been proven, if not wrong, then certainly in a different form than the original data. It takes imagination to be a great scientist. One cannot simply rely on the objective facts of the case. So many mysteries of the universe have yet to be discovered, much less understood, and understanding involves more than objective, logical, facts. How important it is to communicate to lawmakers that we must provide classes to our students that encourage creativity, facilitating more ways of “knowing” than just bare facts.